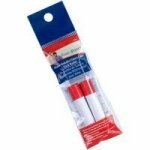 THE best fine/narrow glue marker--recommended by appliqué teachers and masters. The 1/4" pen stick amount allows for a more precise application--necessary for finer appliqué pieces and whenever you want less mess! The pen style container keeps the glue 'fresher longer than any others', another bonus. Blue air-soluble ink shows where glue has been applied. Color fades as glue dries; however, any remaining glue washes out. Soak lace or similar product to completely remove glue if necessary. NOTE - Always test glue on a swatch of fabric to be sure that it can be removed satisfactorily before using on your project. Water-soluble glue REFILLS also here for your convenience. There are other brands of glue pens on the market; however, we have found the FP to be the best buy and does the job as well or better and for less money!